Place a resealable plastic storage bag in a shallow dish. Place pork chops in the bag. In a large bowl, stir water, salt, and sugar together until dissolved. Pour over the chops. Seal bag, pressing out any air. Refrigerate for 4 hours. In a 10-inch skillet heat oil over medium heat. Add onion and cook about 3 minutes. Add the garlic and cook 1 minute more or until onion is tender. Increase heat to medium high. Add beer, vinegar, tarragon, bay leaf, and thyme. Bring to a boil. Reduce heat and simmer, uncovered, 12 minutes or until the mixture has reduced to about 1/2 cup. Remove bay leaf and tarragon sprigs. Remove chops from brine and pat dry with paper towels. Cover; let chops stand to come to room temperature (about 90 minutes). Season with pepper. For a charcoal grill, arrange coals on one side of the grill. Place a drip pan on the other side of the grill. For a gas grill, preheat grill. Reduce heat to medium. Adjust for indirect cooking. Place chops on a grill rack directly over heat. Cover and sear about 3 minutes per side. 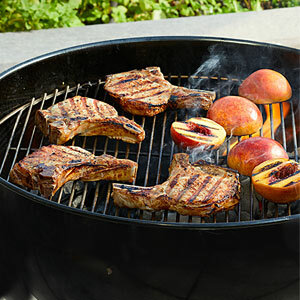 Move chops to the grill rack directly over the unheated side of the grill. Baste with beer sauce. Grill for 5 minutes or until the internal temperature is 145 degrees . Brush generously with sauce. Let chops stand for 5 minutes before serving. *Shopping Tip pork is pretreated with a saline solution. You don't want that when using a brine, chef Colby Garrelts warns. Buy at farmers markets or choose meat labeled organic or heritage. You will absolutely notice a difference in the pork's flavor for the investment.